Wearing your curly hair short can be tricky. While short curls aren't for everyone, there are those who walk amongst us that were just made for short haircuts. We all know lucky ladies who are bold enough to rock a close crop or a pixie. If you're planning on taking the plunge and getting a short haircut, be prepared to own those sheared curls. Remember, with short curly hair less is more. Accessories: Ditch the big hair accessories. Your new ‘do is going to be sensational enough without adorning it with giant rhinestone clips. While you're at it, don't over do it with jewelry. Hoops or earrings bigger than your face are unnecessary with a sophisticated new haircut. Let your curls speak for themselves. 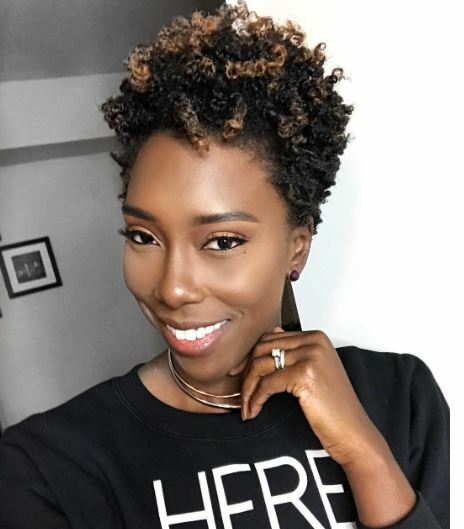 The perfect shaped face: There are a lot of articles out there telling you what shape your face needs to be to rock short curly hair. While short curls puts your face front and center, don't let its shape determine how you cut your curls. Short hair is a strong statement in and of itself. Work with an experienced stylist to find the exact right short haircut that will flatter your curls and your face shape. The perfect bod: Society tells you a lot of what you can and can't do with your personal style. We say don't let others define who you are and how you present yourself to the world. You are not required to have a certain body type, skin color or curl type to rock a short curly hairstyle (or really any style you please.) If a short cut makes you feel beautiful, then do it. Be confident: If you're ready to take the plunge and get a short curly haircut, be ready to rock it. Wearing your new short curly hair without hats, earrings or accessories will take confidence. That's the big secret to having amazing short curls; be ready to let your haircut take center stage. Covering your curls with accessories sends the message that you aren't confident in your choice, so leave them at home! Show us pics of your short curls and let us know what made you decide to take the plunge. Looking for more information on short curls? Check it out here.